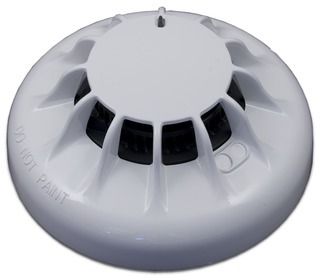 The FC460P is a sophisticated photo optical smoke detector which provides economical fire detection coverage. High, normal or low sensitivity can be set in accordance with EN54 pt. 7. The FC460P incorporates a unique "mousehole" design optical chamber with an unrivalled signal to noise ratio providing high resilience to dust and dirt which means reduced service costs. In addition a unique chamber cover actually draws slow moving smoke into the chamber to provide a more responsive detector. The unique design and the optical chamber screen provide immunity to small insects and thrips. · Usable with standard 4B detector base or the 4BI isolator base.